Cocktail Shaker is one of our products that we are offering to cater to the industry that is dedicated to blending and mixing the contents of the cocktail, mocktail, or juices. Our standing in the industry has helped us to be bracketed with the reliable Exporters, Importers, and Suppliers of Cocktail Shakers in Maharashtra, India. 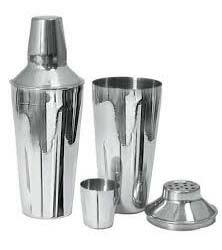 We deal in high quality Cocktail Shakers that are characterized by state-of-the-art design and style. Packaging Details The Packing comes in carton. Each carton consist of 2 set.